Together we want to go to the wellsprings of faith through prayer, bible sharing, common life, personal reflection and silence… We will ask: how can we make our life a “pilgrimage of trust”, searching for communion with God and contributing to reconciliation in our communities. 6.00pm welcome, 7.00pm supper, song practice, 8.30pm evening prayer with the prayer around the cross. Night in Mji dormitories. Saturday: 7.00am morning prayer, breakfast, 8.45am bible introduction, personal meditation, sharing in small groups, 12.30 midday prayer, lunch and departure. Participation in the expenses: 60Ksh. Each day, brothers of Taizé will introduce a Bible reflection, followed by a time of silence and sharing in small groups. In the afternoon, practical work and seminars will help us to deepen the relationship between faith and life. Experiencing a simple life shared with others reminds us that daily life is the place where Christ is waiting for us. Reporting between 3.00pm and 5:00pm. Friday evening prayer is followed by prayer around the Cross. Sunday: celebration in different local communities of the neighbourhood. Please bring with you: Bible, paper and pen, bedsheets, towel, slippers, soap, shoe shine, toothbrush, and personal effects. Do not bring laptop or valuable objects. 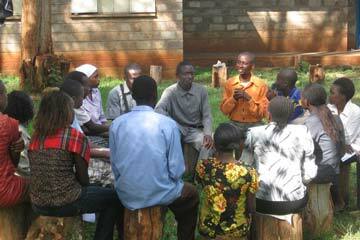 Participation in the costs: for the four days meetings, 450 Ksh, food and accommodation included. The meetings receive no external subsidy but depend on participants’ contributions. Registration: Two weeks before the retreat. Take note that the number of participants is limited to one hundred. We shall not register groups larger than 10 people. Taizé brothers are also available to facilitate, on request, parish or deanery youth retreats at Mji wa furaha or elsewhere. matatu 44 or 45 stop at Safari Park Hotel).